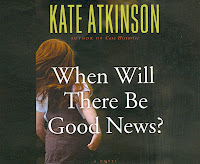 Kate Atkinson's now-familiar characters of Jackson Brodie and Louise Monroe make return appearances in When Will There Be Good News? In keeping with the themes of her earlier books, Atkinson's former police officer Brodie is still trying to rescue "lost girls." Both Brodie and Monroe have embarked on new relationships since the last book in the series, but they are still carrying torches for each other. This book concerns the disappearance of Dr. Joanna Hunter. As a child, Joanna's mother and siblings were murdered but she survived by hiding in a cornfield. Her young "mother's helper", Reggie Chase, a 16-year-old girl with problems of her own, badgers the police and Brodie to look for the missing Dr. Hunter. At the same time, DCI Monroe is attempting to ward off another tragedy, this time in the form of an estranged husband intent on killing his family. The story has many different story lines and characters, and all the loose ends are tidied up at the conclusion. Still, I found the story to be unsatisfying. The main problem I had with it was that many of the main characters (Jackson Brodie, Joanna Hunter, Reggie Chase) had terribly unexpected and unpleasant things happen to them, but they didn't seem to be bothered in the slightest. There was a lot of shrugging and "oh, well"-type reactions that didn't really ring true. Also, Louise Monroe comes across as a truly unpleasant person -- short-tempered, angry, hostile and unreliable -- yet every male she comes across seems to fall instantly in love with her. No matter how many promised meetings she misses, nor how many times she snaps at them, they just keep coming back for more. No one ever seems the least bit put off by her rude and self-centered behavior. Those things made the book hard to like, even though the action was engrossing and entertaining. I'm sure there will be more opportunities to get to know Louise and Jackson, since there were plenty of hints given as to further interaction between them.